Thanks for considering The Psalms of Asaph: Struggling with Unanswered Prayer, Unfulfilled Promises, and Unpunished Evil as a group study. And, I would love your feedback as to what worked and what didn’t. With the study guide online, I’m free to adapt it based on your responses. Email me at jim@jameswatkins.com. Ask, What was the best thing that happened to you the past seven days? After as many as wish have shared, ask, What was the worst thing that happened during that time? Asaph, one of Kings David and Solomon’s chief musicians, wrote twelve psalms that honestly expressed his reaction to the best and worst of Israel at the time. Ask, Have you ever felt that way? Ask members to read the following scriptures and then discuss What bad things were happening? 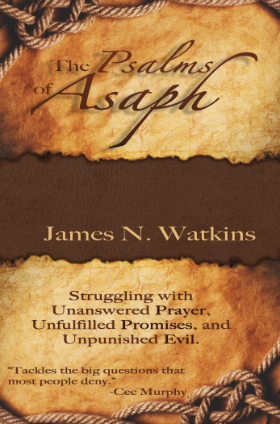 Note, And so, Asaph struggled with unanswered prayer, unfulfilled promises, and unpunished evil. Say, Let’s begin with unanswered prayer. Why is it so unsettling? In all our praying . . . it is important that we keep in mind that God will not alter His eternal purposes at the word of a man. We do not pray in order to persuade God to change His mind. Prayer is not an assault upon the reluctance of God, nor an effort to secure a suspension of His will for us or for those for whom we pray. Prayer is not intended to overcome God and “move His arm.” God will never be other than Himself, no matter how many people pray, nor how long nor how earnestly. What the praying man does is to bring his will into line with the will of God so God can do what He has all along been willing to do. Thus prayer changes the man and enables God to change things in answer to man’s prayer. Ask, With Tozer’s quotation in mind, do you think there really are “unanswered” prayers? Summarize Chapter 2’s illustration of the traffic light. God answers red (no), yellow (slow) or green (go). Ask, What do you think are some causes for “no” answers? Ask members to read the following scriptures and then discuss. Ask, each member to privately consider reasons for their unanswered prayers. Are you coming upon a red or yellow light? Is there an area that needs work to allow for a green light? Consider playing Casting Crown’s Praise You in This Storm, a powerful song about unanswered prayer. Close in prayer submitting requests to God’s love and wisdom. Ask, What was the best promise fulfilled as a child? Note Asaph had a front-row seat to many of God’s fulfilled promises: the return of the Jews to the Promised Land, population growth, widespread territory, peace and prosperity. However . . . Ask, With what unfulfilled promises are you or your friends struggling? The author provides some questions to discern if the promise is for us? Discuss each. Is the promise addressed to a specific individual, a group or the church universal? Is the promise in context? What exactly is being promised? What is an example in your life where waiting was beneficial? Close in prayer asking God to help each know the context and result of the promises and, if they are for us, to wait confidently, hopefully, patiently . . .
Bring enough newspapers for each person in the group or for teams of members. Say, How many examples of unpunished evil can you find in the paper? You have three minutes! Give a small reward for the person who found the most. Say, Unpunished evil is not a new problem. Ask volunteers to read Psalm 74:9-10, Ecclesiastes 3:16, Habakkuk 1:2-4. Ask, What is God’s attitude toward good and evil? Ask volunteers to read the following scripture and then discuss. How does God judge evil? Ask volunteers to read the following scripture and then discuss. Evil begins, in a universe where all was good, from free will, which was permitted because it makes possible the greatest good of all. The corruption of the first sinner consists not in choosing some evil thing (there are no evil things for him to choose) but in preferring a lesser good (himself) before a greater (God). The Fall is, in fact, Pride. Discuss: What is the source of evil? Of temptation? How does Satan tempt people to do evil? Why doesn’t God seem to overtly punish evil in modern times? Why Is God Slow in Bringing Judgment? Psalm 37:9-17, 38-40 (God will bring judgment at the proper time! Close in prayer asking that members don’t fret or get angry, but trust that God will bring justice—eventully—to each act of evil. Consider playing Pam Thum’s song, Life is Hard (God is Good). Life is difficult. This is a great truth, one of the greatest truths. It is a great truth because once we truly see this truth, we transcend it. Once we truly know that life is difficult—once we truly understand and accept it—then life is no longer difficult. Because once it is accepted, the fact that life is difficult no longer matters. Ask, How did Jesus live a difficult life? How did the apostle Paul live a difficult life? Did Jesus promise a life free from difficulties? Why does God allow good people to experience bad circumstances? How has God used trouble to make you more Christlike? Ask group to react to this statement: Life is not designed to make us happy. Life is designed to make us holy! Person A: God is good. Person B: All the time. Person A: All the time. Person B: God is good. Ask, Why do we sometimes doubt that? Read the opening illustration of Chapter 12. Did the author love his granddaughters? Why did they question that love? How does the concept of our ideal TV father differ from God the Father? Can there be real love without corrective love? Assure group that discipline focuses on future beneficial behavior; punishment on past unacceptable behavior. (God does not punish his children. Considering opening today’s session playing Laura Story’s powerful song Blessings. Ask, For the past few weeks, we’ve studied unanswered prayer, unfulfilled promises. What have you learned? • What can I know? God uses trouble to teach his children precious lessons. They are intended to educate us. When their good work is done, a glorious recompense will come to us through them. He does not regard them as difficulties but as opportunities. They have come to give God a greater interest in us and to show how he can deliver us from them. Without difficulties we cannot have a mercy worth praising God for. God is as deep, and long, and high as our little world of circumstances. • Who can I show? Gerry Peters finally has all her questions answered. “When did Jesus know he was God? Did he know it as a little boy? Or did he only know after God his Father announced it at his baptism? After her heart failure and subsequent brain damage, her questions became more childlike, but still equally profound. So, thanks, Gerry, for all your profound and thought-provoking questions. They stretched my thinking. And most of all, thank you for your love for Christ, your pastors, and people of the church. End in prayer for God to provide knowledge, growth and comfort as we confront the questions raised in The Psalms of Asaph. Copyright © 2018 James N. Watkins Permission is granted to duplicate this study guide for local church use only.